Indian and American bride and groom at their engagement party. When Dr. Abbas called me to discuss photographing his son's engagement celebration I was very excited by the idea. I had done Indian celebrations in the past and they are always spectacular affairs and I love capturing the color and the decor. It was a terrific meeting with him and his family and when the day finally came my assistant and i couldn't have hoped for a better welcome. I started by capturing candids of arriving guests and then we stepped around the property in Dyer, Indiana for engagement portraits of Amir and Taylor, our happy couple. Amir and Taylor in front of a gorgeous fountain of the the home of the groom's father. This Indian American engagement celebration was filled with food, laughter and love. Children played and adults mingled as I captured the event reportage style. A mom playfully encourages her child to eat a delicious banana at an engagement party in Northwest Indiana. Amir and Taylor were to exchange gifts on a stage specially built inside the home as friends and family looked on. 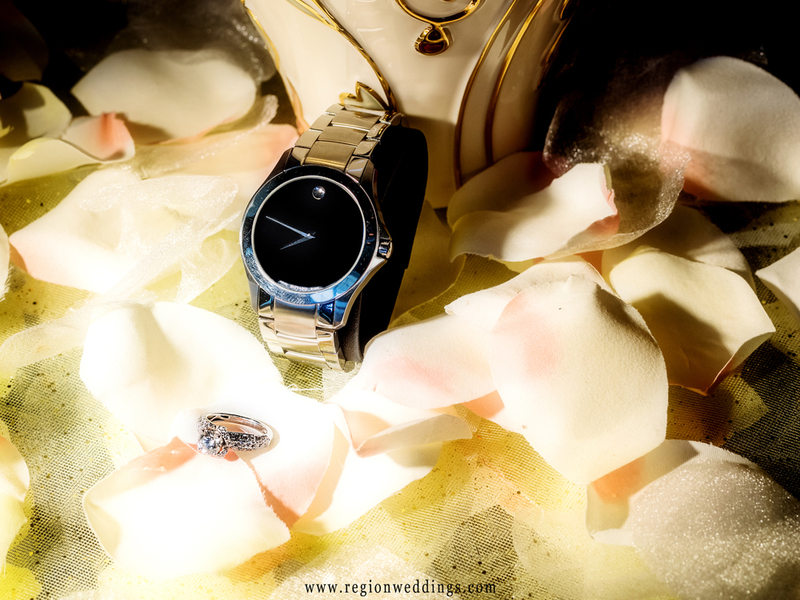 Amir placed the ring upon his bride and she presented him with a beautiful luxury watch. Taylor's American family and her soon to be Indian family were both present on the stage. As Dr. Abbas stated in his terrific speech, we are a melting pot of people and cultures. The engagement celebration was a terrific example of this. A collage of images from an Indian American engagement party. An engagement ring and luxury Swiss watch. 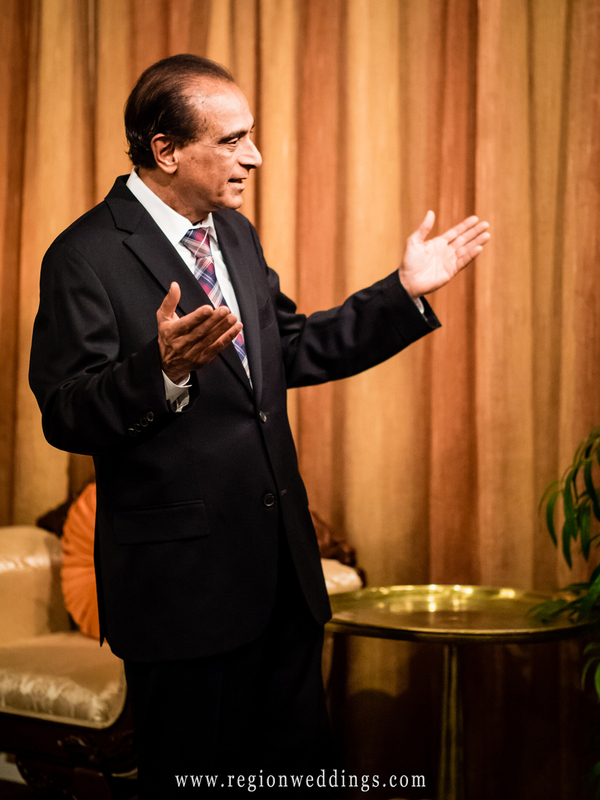 Dr. Mohammed Abbas gives a heartfelt speech at his son's engagement celebration. After the ceremony, dinner was served and it was time for family photographs. A terrific time was had by all and soon they will be together once again for the wedding of Amir and Taylor. Exchanging of the rings at an Indiana American engagement ceremony. Family portrait of the soon to be bride and groom with his parents. 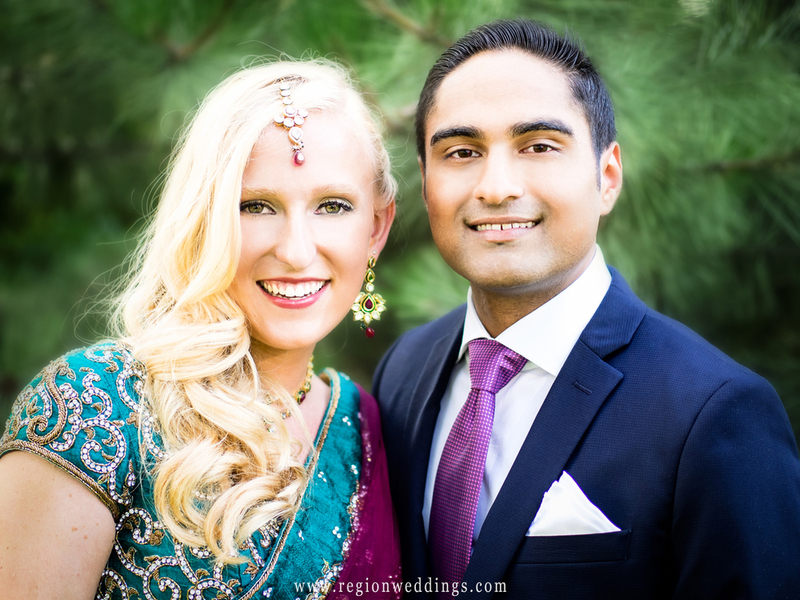 I hope you have enjoyed this sneak peek at Amir and Taylor's Indian American engagement celebration. Subscribe to this page below or the Region Weddings Facebook page for more updates. Once again, congratulations to Amir and Taylor! !